DIAMOND HYDROLYSED WHEY PROTEIN® is an excellent protein supplement based on the highest quality hydrolysed whey protein concentrate. 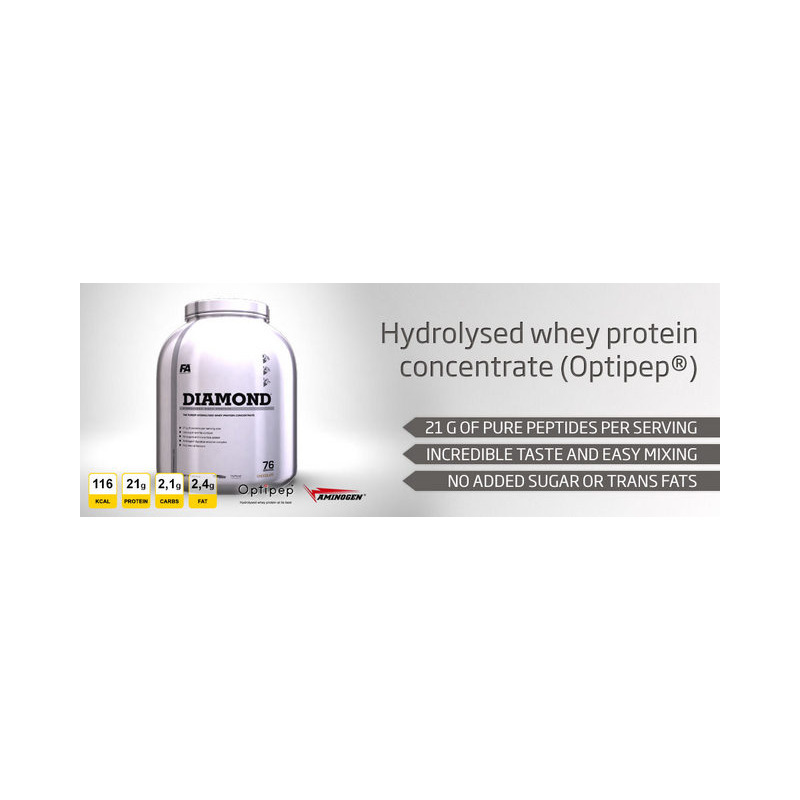 DIAMOND HYDROLYSED WHEY PROTEIN® is obtained by enzymatic (not acid) hydrolysis using AMINOGEN® complex. It means that during production of OPTIPEP®, all delivered protein is pre-digested by active enzymes what results formation of very easy assimilated tri- and dipeptides. 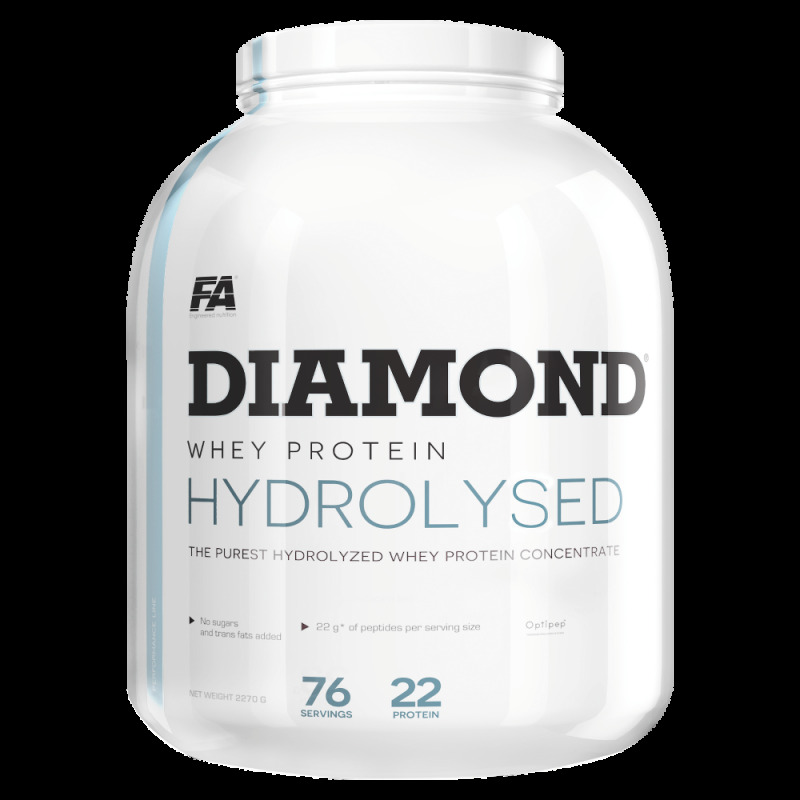 Moreover, DIAMOND HYDROLYSED WHEY PROTEIN® is additionally ultra-filtered using spiral membrane technology what ensures the unique quality of provided hydrolysed whey protein concentrate. Each serving provides 22 g of proteins (as polypeptides) which contributes to a growth and maintenance of muscle mass and contributes to the maintenance of normal bones. Ingredients: OPTIPEPTM [hydrolysed whey protein, emulsifier (soy lecithin)], cocoa1, flavourings, colours (carotene4, beetroot red3,4), sweeteners (acesulfame K, sucralose), salt, digestive enzyme (Aminogen®), colour (beetroot red)2. Recommended Use: Mix 1 scoop (30 g) with 300 ml of water, milk or juice. Drink 1 portion immediately after waking up and second immediately after workout. Warnings: With sweeteners. Contains milk, soya. do not use if pregnant or nursing. Do not use if you are allergic to any ingredients contained in this product. A varied and balanced diet and a healthy lifestyle are recommended. Store in a cool, dry place, away from direct sunlight.